Is there a better time of year to receive than Christmas? No. Is there a better time of year to be alive and in the mix for a fantasy football league championship? Well, this is the only time of year for that, so on to the business at hand. Whether you are playing for that title this week or next or just hoping to limp into that consolation championship thereby waiving your league's entry fee for next season, we've got you covered with the week 16 wide receiver rankings. We hope St. Nick brings you what you're asking for. If that happens to be a league title, good luck; we asked him for that each of the last four years and all we've got are a couple of aforementioned waived entry fees. Ho, ho, and indeed, ho. Here are your week 16 wide receiver rankings. Reminder: Odell Beckham, Jr. is suspended this week. I know, I know. 1. Antonio Brown @ BAL- Brown and Big Ben Roethlisberger are back in sync. All is right in the world. 2. Odell Beckham Jr. @ MIN- As of now, OBJ is suspended. In the extremely unlikely case that his appeal is successful, we'll go ahead and leave him in this space. Had a topsy-turvy week 15 in which he and Josh Norman's on-field antics overshadowed their actual matchup within the game. 3. Allen Robinson @ NO- Beautiful matchup against the Saints, though he'll likely see plenty of the underrated Delvin Breaux. The Jags offense will look to shine on the fast track inside the Superdome. Don't sleep on Allen Hurns this week either. 4. Alshon Jeffery* @ TB- Hamstring injury will be something to watch, but Jeffery should be penciled in as a top-5 play if he can go. The only thing that has really managed to stop Alshon this season is the myriad of lower-body injuries he has had to battle. 5. 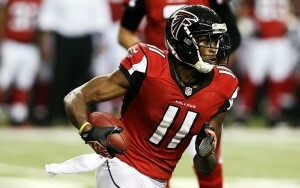 Julio Jones vs CAR- Julio is a stud, and we always ride our studs this time of year. Josh Norman just had himself a busy day against Odell Beckham Jr., and Jones is more of a physical specimen. Had 7 grabs for 88 yards in their most recent matchup. 6. Larry Fitzgerald vs GB- These two teams seem to always light it up through the air, and Fitzy is probably licking his chops in preparation for a leaky Packers unit. 7. Calvin Johnson* vs SF- Megatron gets himself a date with a team that is barely there in spirit or in person. Ankle issue is a formality. 8. Brandon Marshall vs NE- Marshall saw his streak of 100-yard performances snapped in week 15 but will have another monster workload coming his way against the rival Patriots in week 16. 9. Jarvis Landry vs IND- Landry's workload as a receiver and extension of the running game make him a PPR beast. Miami will need him to thrive on those high-efficiency plays against Indy. 10. DeAndre Hopkins @ TEN- Hopkins' everchanging quarterback situation hasn't helped, but he's a top-10 play based on talent alone. This is the type of matchup that can get him back on track, regardless of whom is under center. Julio Jones is almost always a top-5 play. 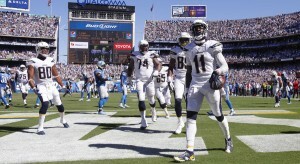 Stevie Johnson (groin) hopes to be back in week 16. Nate Washington @ TEN- Solid player who should see a few looks in a hashtag revenge game. Nelson Agholor vs WAS- Had the best game of his rookie year in week 14 and finally looks healthy. Robert Woods* vs DAL- Woods is as slippery as they come and should be able to exploit a matchup or two against a beatable Dallas secondary. Knee injury does not appear to be a major concern at this point. Merry Christmas and good luck in week 16.